Pharmacists can help asthma patients by educating them about how to keep their asthma under control, and how to tell if it isn't. Spacers/valved-holding chambers are an important part of medication delivery for most quick-relief and long term control asthma medications. Visit our medication page to see which MDIs need a spacer. Many brands of these devices and their masks are now on the Medicaid Plan Common Formulary (pages 117-119) so keeping the right ones in stock is easier. All of the Medicaid plans allow up to 4 spacers/valved-holding chambers per year with no prior authorization. Many peak flow meters are also included on the Common Formulary (page 117). 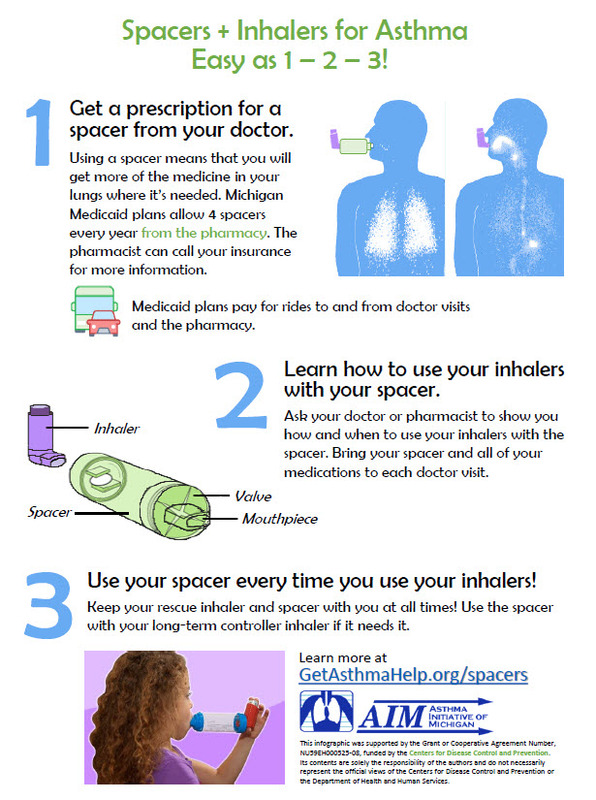 Print this spacer infographic and give it to your Medicaid patients to help them understand how to get a spacer.